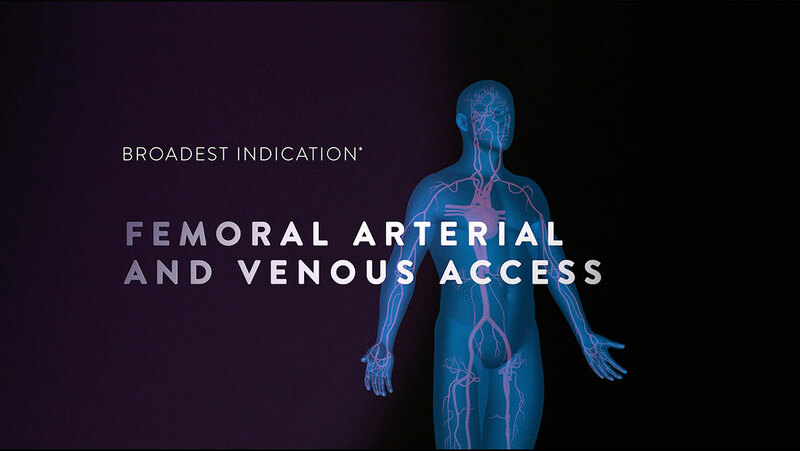 The Perclose ProGlide® vascular closure system has the broadest indication for both femoral arterial and venous access. *As compared to Angio-Seal®, Celt ACD®, ExoSeal®, Mynx®, Vascade®. Data on file at Abbott. 2. For sheath sizes greater than 8F, at least two devices and pre-close technique are required. Perclose ProGlide® provides percutaneous surgical repair with a suture by delivering a secure, non-masking percutaneous repair. Perclose ProGlide® promotes primary intention healing1 with less scarring2, and reduces time to hemostasis, ambulation and discharge3,4. 1. Primary intention healing occurs where vessel wall edges are brought together, adjacent to each other. This can be achieved with suture, stitches, staples, and clips. 2. Mercandetti, Michael. Wound Healing and Repair. Medscape. WebMD, 19 May 2017. Web. March 21, 2018. 3. Time to hemostasis, ambulation, and discharge applies to the arterial access. 4. U.S. Perclose ProGlide Instructions for Use. 5. Perclose ProGlide Versus Surgical Closure Outcomes – Real World Evidence. Schneider, Darren B; Krajcer, Zvonimir; et al. LINC 2018. The Perclose ProGlide SMC System is indicated for the percutaneous delivery of suture for closing the common femoral artery and vein access site of patients who have undergone diagnostic or interventional catheterization procedures. The Perclose ProGlide SMC System is used without or, if required, with adjunctive manual compression. For access sites in the common femoral artery using 5F to 21F sheaths. For access sites in the common femoral vein using 5F to 24F sheaths. For arterial and venous sheath sizes greater than 8F, at least two devices and the pre-close technique are required. Federal law restricts this device to sale by or on the order of a physician (or allied healthcare professionals, authorized by, or under the direction of, such physicians) who is trained in diagnostic and / or interventional catheterization procedures and who has been trained by an authorized representative of Abbott Vascular. Prior to use, the operator must review the Instructions for Use and be familiar with the deployment techniques associated with the use of this device. During closure of access sites using a procedural sheath greater than 8F it is recommended that a vascular surgeon or a surgeon with vascular training be available in case surgical conversion to control bleeding and to close the vessel is needed. There are no known contraindications to the use of this device. Attention is drawn to the WARNINGS and PRECAUTIONS sections. Do not use the Perclose ProGlide SMC device or accessories if the packaging or sterile barrier has been previously opened or damaged or if the components appear to be damaged or defective. DO NOT RESTERILIZE OR REUSE. The Perclose ProGlide SMC device and accessories are intended for single use only. Do not use the Perclose ProGlide SMC System if the sterile field has been broken where bacterial contamination of the sheath or surrounding tissues may have occurred, since such a broken sterile field may result in infection. Do not use the Perclose ProGlide SMC System if the puncture site is located above the most inferior border of the inferior epigastric artery (IEA) and / or above the inguinal ligament based upon bony landmarks, since such a puncture site may result in a retroperitoneal hematoma. Perform a femoral angiogram to verify the location of the puncture site. NOTE: This may require both a Right Anterior Oblique (RAO) and Left Anterior Oblique (LAO) angiogram to adequately visualize where the sheath enters the femoral artery or vein. Do not use the Perclose ProGlide SMC System if the puncture is through the posterior wall or if there are multiple punctures, since such punctures may result in a hematoma or retroperitoneal bleed. Do not use the Perclose ProGlide SMC System if the puncture site is located in the superficial femoral artery or the profunda femoris artery, or the bifurcation of these vessels, since such puncture sites may result in a pseudoaneurysm, intimal dissection, or an acute vessel closure (thrombosis of small artery lumen). Perform a femoral angiogram to verify the location of the puncture site. NOTE: This may require both a Right Anterior Oblique (RAO) and Left Anterior Oblique (LAO) angiogram to adequately visualize where the sheath enters the femoral artery or vein. Prior to use, inspect the Perclose ProGlide SMC System to ensure that the sterile packaging has not been damaged during shipment. Examine all components prior to use to verify proper function. Exercise care during device handling to reduce the possibility of accidental device breakage. As with all catheter-based procedures, infection is a possibility. Observe sterile technique at all times when using the Perclose ProGlide SMC System. Employ appropriate groin management, as per hospital protocol, post procedure and post hospital discharge to prevent infection. Use a single wall puncture technique. Do not puncture the posterior wall of the vessel. Do not deploy the Perclose ProGlide SMC device at an angle greater than 45 degrees, as this may cause a cuff miss. There are no reaccess restrictions if previous access site repairs were achieved with Abbott Vascular SMC devices. If significant blood flow is present around the Perclose ProGlide SMC device, do not deploy needles. Remove the Perclose ProGlide SMC device over a 0.038" (0.97mm) (or smaller) guidewire and insert an appropriately sized introducer sheath. When pushing the plunger assembly to advance the needles, stabilize the device to ensure the device does not twist or move forward during deployment. Twisting the device could lead to needle deflection resulting in a cuff miss. Do not use excessive force or repeatedly push the plunger assembly. Excessive force on the plunger during deployment could potentially cause breakage of the device, which may necessitate intervention and / or surgical removal of the device and vessel repair. Do not apply excessive force to the lever when returning the foot to its original position (marked #4) down to the body of the device. Do not attempt to remove the device without closing the lever. Excessive force on the lever of the device or attempting to remove the device without closing the lever could cause breakage of the device and / or lead to vessel trauma, which may necessitate intervention and / or surgical removal of the device and vessel repair. Do not advance or withdraw the Perclose ProGlide SMC device against resistance until the cause of that resistance has been determined (see Section 11.3 Single SMC DEVICE PLACEMENT section). Excessive force used to advance or torque the Perclose ProGlide SMC device should be avoided, as this may lead to significant vessel damage and / or breakage of the device, which may necessitate intervention and / or surgical removal of the device and vessel repair. If excessive resistance in advancing the Perclose ProGlide SMC device is encountered, withdraw the device over a 0.038" (0.97 mm) (or smaller) guidewire and reinsert the introducer sheath or use manual compression. 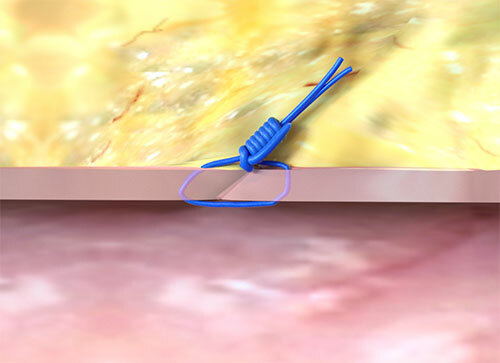 Remove the Perclose ProGlide sheath before tightening the suture. Failure to remove the sheath prior to tightening the suture may result in detachment of the tip of the sheath. In using this or any other suture material, care should be taken to avoid damage from handling. Avoid crushing damage due to application of surgical instruments such as clamps, forceps or needle holders. During closure of access sites using a 5 – 8F procedural sheath, use manual compression in the event that bleeding from the femoral access site persists after the use of the Perclose ProGlide SMC device. During closure of access sites using a procedural sheath > 8F, in the event that bleeding from the femoral access site persists after the use of the Perclose ProGlide SMC devices, the physician should assess the situation. Based on the physician assessment of the amount of bleeding use manual compression, compression assisted devices and / or a surgical repair to obtain hemostasis. During closure of access sites using a procedural sheath > 8F, in those cases where the implanting physician is not a vascular surgeon, it is recommended that a vascular surgeon or a surgeon with vascular training be available during the procedure to perform any necessary surgical intervention. CAUTION: This product is intended for use by or under the direction of a physician. Prior to use, reference the Instructions for Use inside the product carton (when available) or at eifu.abbottvascular.com or at manuals.sjm.com for more detailed information on Indications, Contraindications, Warnings, Precautions and Adverse Events. Tests performed by and data on file at Abbott. Illustrations are artist's representations only and should not be considered as engineering drawings or photographs. Photos on file at Abbott. Perclose ProGlide is a trademark of the Abbott Group of Companies. Angio-Seal and FemoSeal are trademarks of Terumo Interventional Systems. Celt ACD is a trademark of Vasorum Medical Device Research and Development. 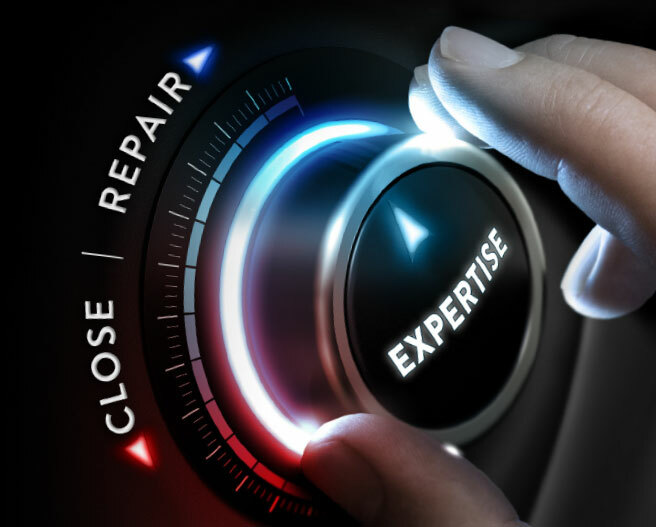 ExoSeal is a trademark of Cordis, a Cardinal Health Company. Mynx is a trademark of Cardinal Health. Vascade is a trademark of Cardiva Medical, Inc.
Are you a healthcare professional in the U.S. or outside of the U.S.? Please fill out the form below. An Abbott Sales Rep will be in touch shortly. Yes, I'd like to be informed about Abbott products and be invited to symposia, events and more. An Abbott Sales Rep will be in contact with you shortly.